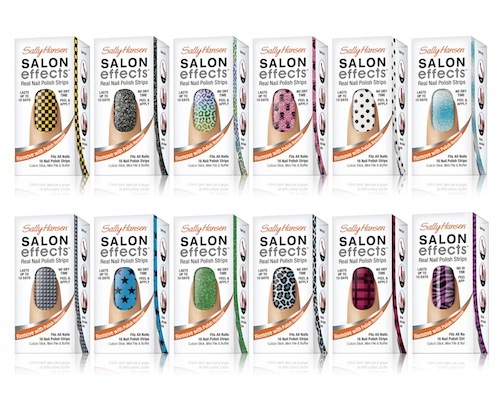 Avril Lavigne designs new Sally Hansen Salon Effects Real Nail Polish Strips! Last night, I was invited to the Crosby Hotel to meet pop star Avril Lavigne for her newest endeavor: designing a limited-edition collection of Sally Hansen’s Salon Effects Real Nail Polish Strips! As a musician and designer (her clothing line, Abbey Dawn features tees, hoodies, and tanks all stamped with Lavigne’s signature punk rock aesthetic), she’s one who certainly has a distinct style. Which is exactly while Sally Hansen said she was on the top of their list to collaborate with. 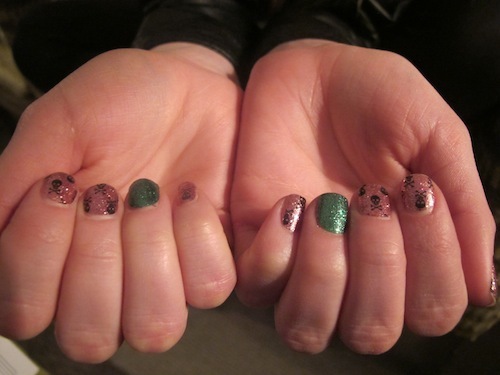 Avril's nails -- a mash up of Headbanger and Beat You to it! While we sat with her, Lavigne, who was wearing her pink-with-skulls “Headbanger” design, opened a box of her green “Beat You To It!” and started applying right over the first set of her nail strips. “It’s so easy! And this green…you guys totally nailed this color,” she said (no pun intended). Avril told us when she began designing the nail strips a year ago, she had green ombre highlights in her hair and thought it would look beautiful for nail strips. The silver/teal ombre of “Crowd Surfer” and “Beat You To It!” are her two current favorites! And for her, another plus for the no-dry-time nails: They withstand her constant guitar strumming (not the case with regular nail polish). The one thing she said she was positive she did NOT want in her designs from the beginning? “Florals!” Not too surprising ;). I couldn’t wait to try them on myself when I got home, and went straight for the black and blue “You’re a Star” (my favorite colors!). The electric blue is UN-Real. What do you guys think? Do you guys like her designs? Is it what you would have expected from the punk princess? 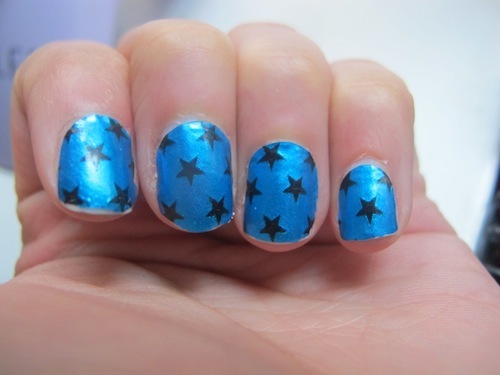 Read more about Sally Hansen nail strips on BATF: Frock Star, Plaid About You, Misbehaved. Avril’s collection is already rolling out to stores, and will be available in April at drug stores and mass merchandisers nationally for $10/pack. A great information about nail arts. I like the bluish star design the last one. Can you give more designs?